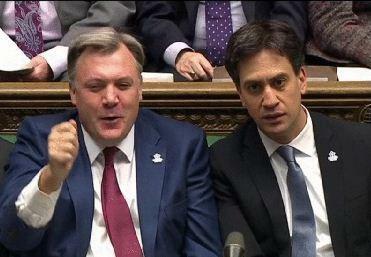 Ed Miliband, most people agree, is set to be the leader of the largest party at Westminster next year at least. This would give him overall charge of the legislature and the executive on 8 May 2015. He has also pledged to produce 20,000 extra nurses, though talk is cheap. George Osborne has failed on virtually all ambitions that were set for the economic performance of the current Government. The Conservative-Liberal Democrat coalition therefore bequeath the next Government with a society with a terrible frail economy. This UK economy is essentially a bargain basement one. It is easy to spot the major fault with ‘the record number of jobs’ meme, as the actual till receipt income is very low. And yet the Conservative want to pay for tax cuts – we’ve gone from an over bloated state to an under nourished one. I had the enormous pleasure, with two other Dementia Friends Champions Chris Roberts and Jayne Goodrick, of giving a Dementia Friends information session at my law school yesterday. I can’t praise enough the amount of support we were given from the people who run Dementia Friends. Forgive my photography. I am no David Bailey*. We actually had a good turnout, but I managed to capture the part of the audience which was very lean. Chris Roberts (@mason4233) lives well with a mixed type of dementia, thought to be a mixed Alzheimer’s disease and vascular dementia. The “Dementia Friends” initiative has been a successful one. From the Alzheimer’s Society, and supported at a distance by Public Health England, it is modelled on the Japanese ‘caravan befriending’ movement. Its aim in policy terms was to break down the stigma, prejudice and discrimination which can happen against people living with dementia. These factors can contribute to the social isolation often experienced by people on receipt of a probable diagnosis. “Dementia Friends” has been brilliant for myth busting, with actual facts about dementia too. Recently, Kate Swaffer (@KateSwaffer), leading international advocate living well with dementia, and working with Alzheimer’s Australia, leading for the Dementia Alliance International, met Dennis Gillings this week in a small group of people for dinner. Gillings is the newly appointed World Dementia Envoy. For reasons which are completely inexplicable, there is no established substantial representation on that panel from the communities of people living with dementia or caregivers, although Hillary Doxford was documented in the Communiqué of the last meeting just gone. When Dennis met Kate recently, Kate quipped, typically characteristically in a beautiful tongue-in-cheek manner, she had not ben dribbling into her soup (Kate’s blogpost here). 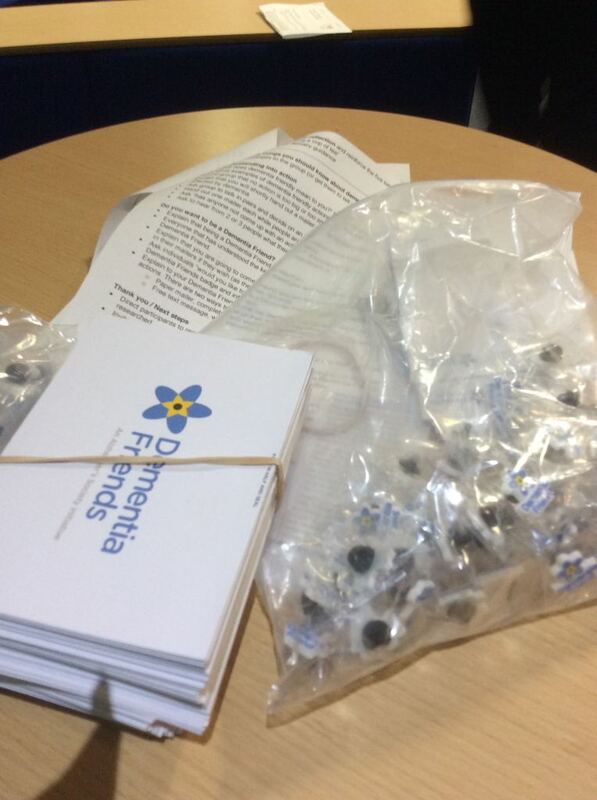 But “Dementia Friends” is an interesting example of a private-public initiative with a £2.4 million funding base. Had this been left entirely to ‘market forces’, it is unlikely there would have been national outreach for this unique project. Inevitably the topic in policy terms is whether the substantial cost of Dementia Friends is offset by the value of raising the profile of dementia and caregivers. Where it might fail on its outcomes, and time will tell, is how the pledges of turning communication into action are actually hard evidenced through the number of pledges (irrespective of whether it will hit its target of one million within an extended deadline of the end of 2015). In my opinion, it has been. 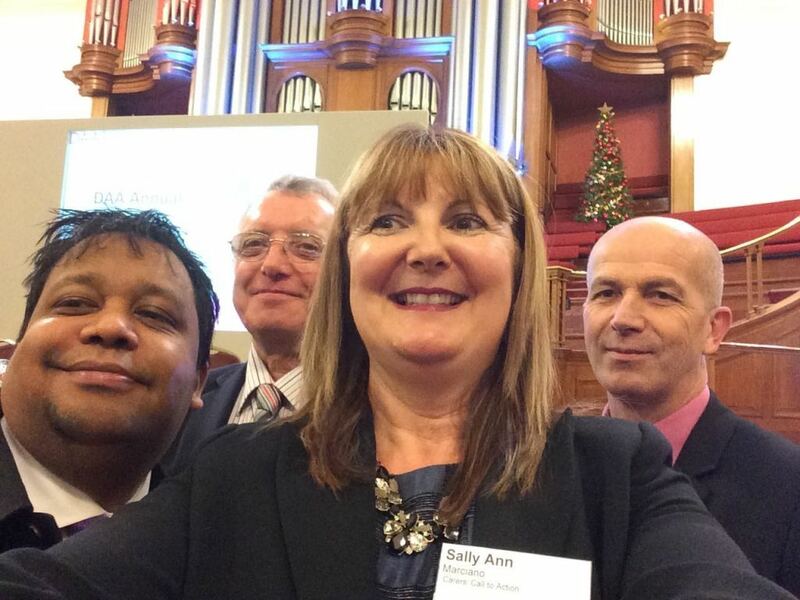 Two days previously, I enjoyed being at the Methodist Central Hall for a day for the Dementia Action Alliance. And yet it is also true that social care is on its knees. You don’t have be a great story teller to communicate a tale of the NHS on its knees. This is somewhat cognitively dissonant with MPs wearing their Dementia Friends badges with pride, one could argue. I agree with Jeremy (tweet here) in that the third sector should not need to apologise for fundraising. Making a surplus for a charity is a raison d’être for a charity akin to the duty to maximise shareholder dividend for a business. But larger charities share many operational and cultural characteristics with corporates conceivably, and therefore the principles of a good ‘corporate citizen’ could easily apply to large charities with substantial revenues. Sube Banerjee, long time supporter of the Alzheimer’s Society, and, perhaps more significantly here, co-author of the previous 2009 English dementia strategy came to the Dementia Action Alliance table with some noteworthy criticisms of how the current strategy had been executed. 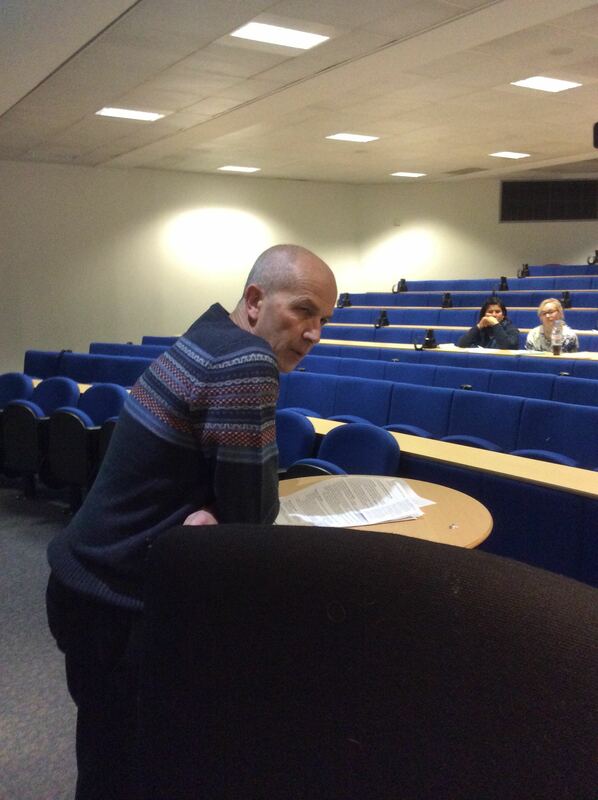 Firstly, Sube, now a Chair of dementia at the Brighton and Sussex Medical School, commented on the devaluing of the ‘cost’ of a diagnosis to £45, and commented specifically on the culture of a ‘high quantity low quality’ approach to diagnosis. Indeed, the 2009 English dementia strategy, called ‘Living well with dementia’, refers to the need for high quality diagnosis. And the English dementia policy as it was then, before it got taken over by the Prime Minister’s Dementia Challenge, due to expire next March 2015, also warned about the lack of post-diagnostic support. People living with dementia, and their family members, have consistently remarked to me how they have been told by medical professions that their rôle is at the very start and very end of “the dementia journey”. They won’t be there for them in between. We are all aware of recent findings that 9 out of 10 care homes failing to meet standards set by the regulator the Care Quality Commission, reported not just in the Daily Mail. So there is an overwhelming sense that people with a possible diagnosis of dementia are being set up for a fall by an inadequate care system, which is disjointed, increasingly privatised, and undervalued. One of the undesirable consequences of this bargain basement economy is the sheer undervaluing of paid carers on zero hour contracts, some not even getting any travel expenses or the national minimum wage. This poses serious questions about us as a society. So does the lack of support we appear to be giving unpaid family caregivers, an army of which nearing a million are the backbone of the entire system. Well, this question has taken on a new twist. I do not see there to be a ‘competition’ as such between ‘dementia advisers’ of one charity and ‘specialist nurses’ from another third sector charity. I think they co-exist. ‘Dementia advisers’ are possibly more useful for the more independent parts of the support of “the dementia journey”. ‘Specialist nurses’ are pivotal at all parts, including the care part of ‘the dementia journey’. It has struck me how not only cost effective clinical specialist nurses are, in providing proactive case management for people with dementia with personalised care plans, ‘nipping in the bud’ complications from medical conditions. I know internationally one of the campaigning for fundraising themes is the substantial co-morbidity of dementia. People living with dementia often have a plethora of other problems, such as in joints, heart or lung. Sally Greengross has long made it been known that the post diagnostic support for dementia is not good enough. Sally Greengross is the current Chair of the All Party Parliamentary Group on dementia. Her predecessor, Jeremy Wright MP, currently the Government’s Attorney General, launched the highly successful policy here in England of an ambition to reduce the number of inappropriate prescriptions for antipsychotics predominantly in care homes. Hospitals can be some of the worst places a person with dementia to end up in. Likewise, it shouldn’t be conceived that secondary hospital care is necessarily synonymous with someone who has ‘failed’ somehow. But, say, end of life nurses will be able to provide expert help, wherever the appropriate care setting is deemed to be for a person living with dementia (and his/her friends or family). And it is therefore possible charities such as Dementia UK and others might be able to fill these gaps in service provision. For a start, clinical nursing specialists comprise an innovative way of delivering the dementia post-support service. And the NHS has a statutory duty to promote innovation. However, I should say that that statutory clause (14X) on CCGs is from the much loathed Health and Social Care Act (2012), about to be repealed by the next Labour government. It is sometimes the case innovation can be incubated in places other than the NHS, and we’ve already seen a lot of goodwill and real-life financial support for Macmillan nurses. It would be impossible now to think of palliative care for nursing in cancer to be without Macmillan nurses – and the prime contractor model could be a way of providing sustainability in critical areas of services. This is ONLY provided that the quality and cost effectiveness components are managed correctly and for the benefit of the taxpayer. The next Labour government wishes to bring out a huge systemic innovation of integrating health and care into whole person care. This is long overdue, as, for example, it is impossible in places to discharge NHS patients to social care in s timely fashion. This is not cost effective; it is insulting particularly to patients including frail old citizens who do not wish to be in hospital anyway, and do not deserve the pejorative insulting label of “bed blocker”. I am sure Alistair (@ABurns1907), or whoever ends up predominantly penning the new English dementia strategy, will wish to give careful consideration to how this post diagnostic support can be provided. Jeremy has a point, but up to a point. Background: There have been numerous concerns that the health and care system in England is too fragmented, and lacks sufficient focus for a person with dementia or caregiver to navigate through the system. A complex array of health and social care services is needed to support people living with dementia; “carers find navigating systemic issues in dementia care time-consuming, unpredictable and often more difficult than the caring work they undertake.”(Peel and Harding, 2014). One of the “pillars” of the Scottish strategy invokes a “dementia practice coordinator“. This rôle is: “a named, skilled practitioner who will lead the care, treatment and support for the person and their carer on an ongoing basis, coordinating access to all the pillars of support and ensuring effective intervention across health and social care”. There are a number of possible professions which might be involved in this care coordinating role: for example, GPs taking a proactive approach to their patients, or social care practitioners who might have particular expertise in safeguarding issues (e.g. Manthorpe et al., 2007). The Alzheimer’s Society suggest a “dementia adviser” role. Clinical nurse specialists (CNS) in cancer perform a range of complex activities, including the management of care. Recent evidence from the University of Southampton suggests that a properly trained and educated dementia specialist nurse, undertaking a clearly defined role, and working directly with people with dementia and their carers for a significant proportion of the time, could benefit people with dementia in hospitals. If these benefits addressed only a fraction of the excess stays experienced by people with dementia, a significant return on investment could be obtained. CNS who practise proactive case management and refocus services in line with best practice represent a good return on investment (Leary and Baxter, 2014). Recently, calls have been made to expand a pioneering dementia pilot in Norfolk after an almost £110,000 investment resulted in more than £400,000 savings for health and social services in less than a year. The meaning of the term ‘timely diagnosis’ in dementia has recently come under close scrutiny. The Carers Trust has been working with the Royal College of Nursing to adapt the Triangle of Care to meet the needs of carers of people with dementia when that person is admitted to a general hospital. 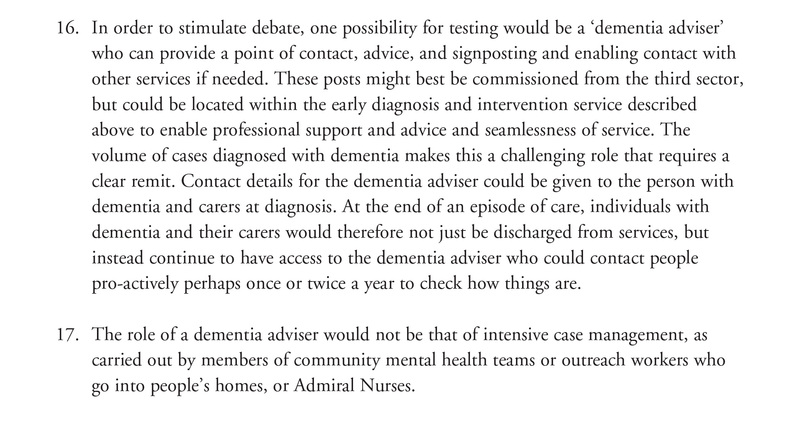 This approach, which has gathered some momentum in English policy, puts the person living with dementia in a ‘triangle of care’ in a ‘triangle of care’ with professional and carer (see page 6). There is clearly a potential rôle for a third sector charity, such as Dementia UK, in providing clinical nursing specialist input. The success of Macmillan Cancer in the ‘prime contractor’ model for integrating cancer and end-of-life care in Staffordshire, as an example of outcomes-based commissioning, is, arguably, a very good recent paradigmatic example. Aim: To conduct a preliminary online survey into citizens’ attitudes to what post-diagnostic support in the English jurisdiction could look like. Methods: 87 respondents completed the online “Surveymonkey” survey, invited from a Twitter account with around 12000 followers. The survey could only be completed once. You were invited to be a person who had just received a diagnosis of dementia in the English jurisdiction. Q1. 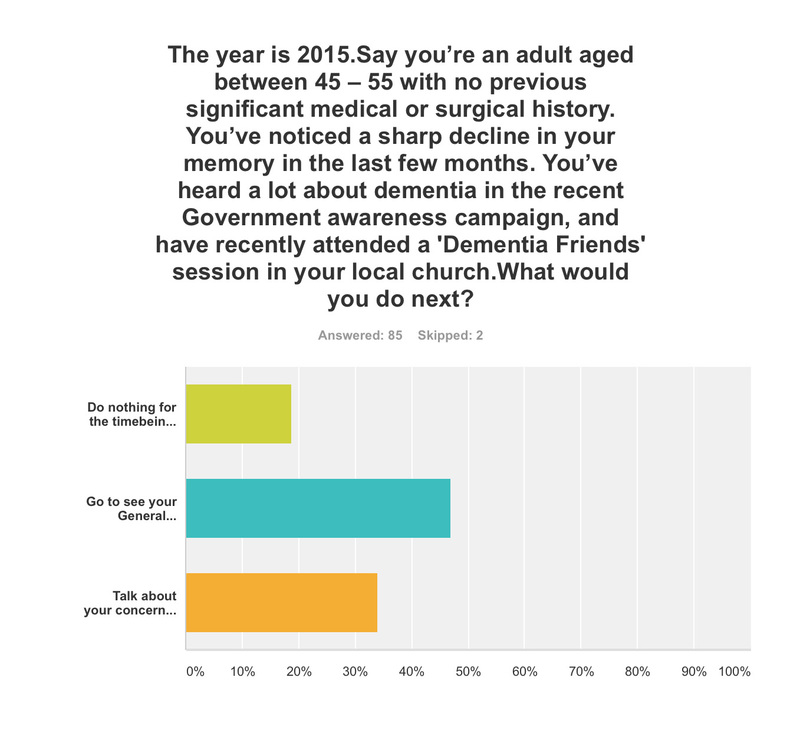 By far, the most preferred option was to go to see your General Practitioner with a view to receiving, if correct, a diagnosis of early dementia, if you’d noticed a decline in your memory and been aware of a public campaign on dementia (47%); talking about your concerns with your friends or family, to see what they suggest, was the next preferred option (34%). Q2. This was extremely finally balanced. 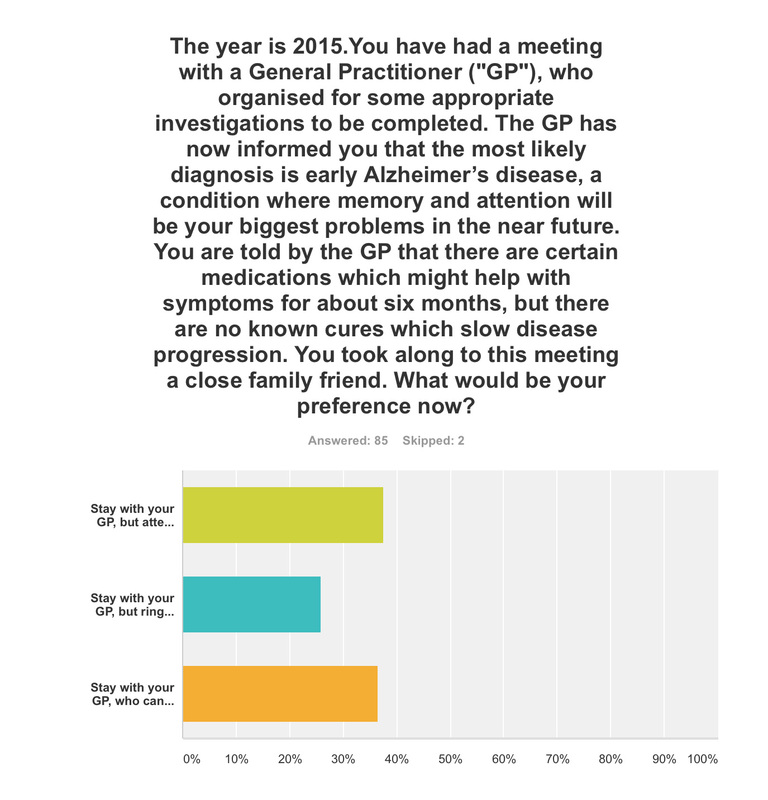 One option was most preferred (38%), that of staying with your GP, but attending for the next couple of years regular six-monthly meetings with a hospital neurologist to observe follow-up with CPN support; but only just, as staying with your GP, who can help organise care and support for you and your closest consisting of a multidisciplinary team, was the next preferred option (36%). The option to stay with your GP, but ring up a local charity helpline to see what they can suggest to help you, regarding information and life choices, was the least preferred (26%). Q3. The option where a clinical nursing specialist had been added incrementally to a speech and language therapist and clinical psychologist was by far the most popular option (72%). Q4. The option where you initiated follow-up for post-diagnosic support following diagnosis as soon as possible, relatively in 2017, was by far the most popular option (92%). Q5. Three options were given for who the ‘care coordinator’ could be. 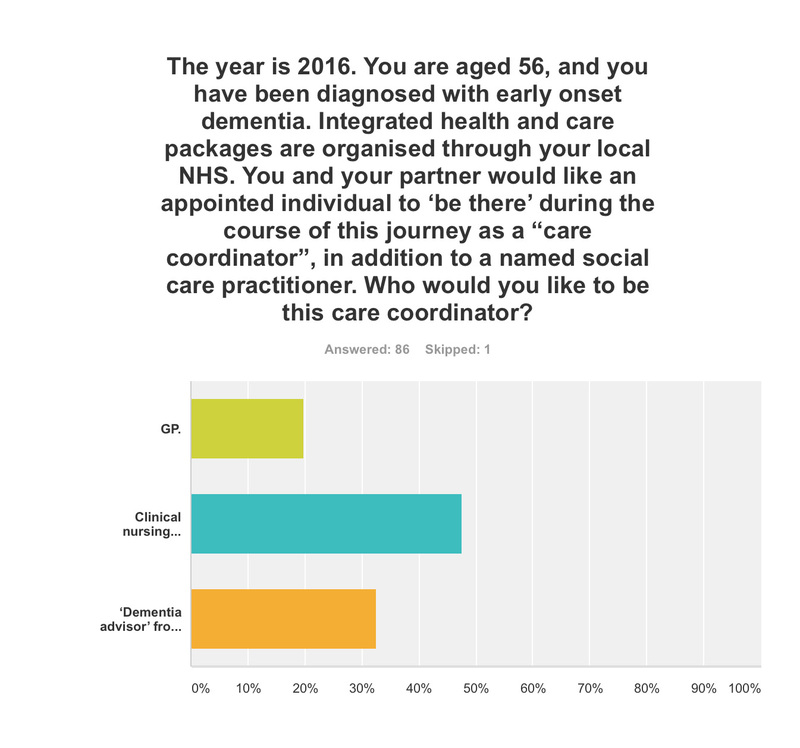 A clinical nursing specialist was by far the most preferred option (48%), then ‘dementia adviser’ from a well known charity (33%), and then the GP last (19%). The rôle of the ‘dementia adviser’, particularly at the earlier stages of the condition at least, is clearly worth considering in future policy such as the English dementia strategy 2015-20. Q6. 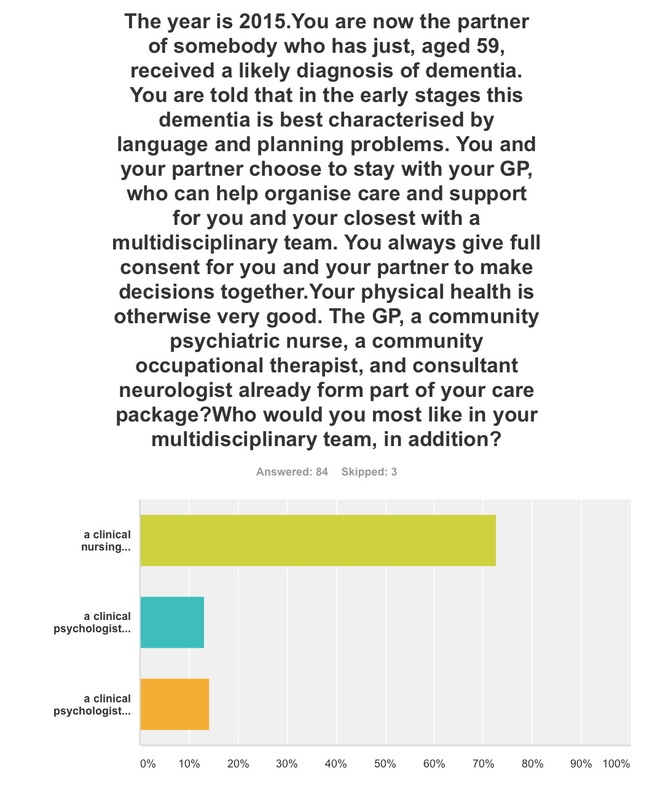 This question asked who you would like the most to organise your care plan with you: your primary caregiver was the most popular choice (44%), with a clinical nursing specialist the next popular choice (36%). Q7. Here it was introduced that a clinical nursing specialist was one of the options in the new English dementia strategy (2015-20). The rationale for this, most felt, should come from clinical outcomes (76%), then financial considerations from the funding situation of the NHS and care (14%). The option where powerful lobbying from charities (“third sector”) should be the driver for specialist nurses was the least preferred (10%). 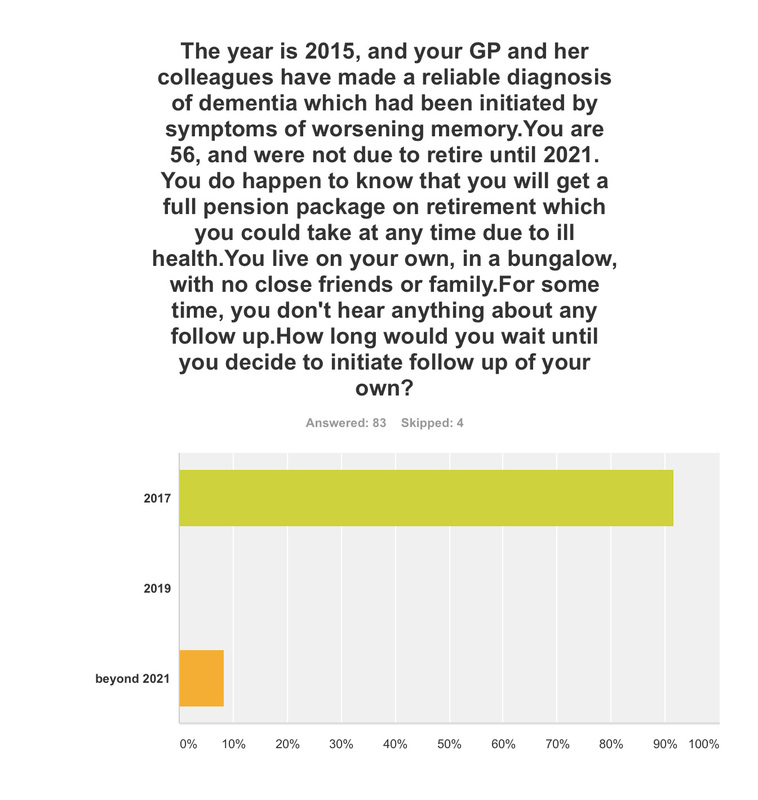 Discussion: The results confirm previous anecdotal reports of the need for timely post-diagnostic support following ‘timely diagnosis’. They paint a picture of a person who has become aware of dementia awareness campaigns and noticed possible symptoms in himself wishing to trust to see a General Practitioner to receive a diagnosis. On receipt of that ‘timely diagnosis’, he or she would be keen to initiate post-diagnostic support as soon as possible, with a multidisciplinary team; it is striking that a clinical nursing specialist was preferred to the rôle of the ‘dementia adviser’ from a charity previously mooted; and that the decision in policy to implement clinical nursing specialists should be made on the basis of clinical outcome, not financial pressures in which the NHS and care find themselves. 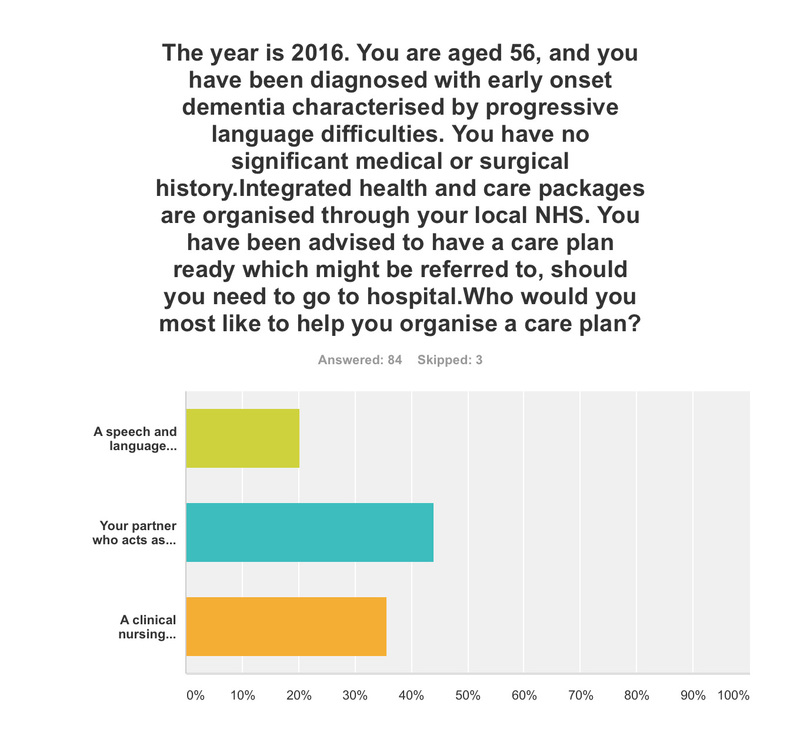 Notwithstanding that, the results support heavily a ‘triangle of care’ involving a caregiver and a professional, such as a person living with dementia, in the formation of a personalised care plan. Limitations: There are no geographical data of the locations, or other demographic data, of the respondents to this online survey. Responses might be biased by the nature of the Twitter threads which had invited respondents to participate, or the nature of the followers of those threads. The questions assume a working knowledge of what the key personnel in a multidisciplinary team for dementia care and support do. Although respondents were advised to select one of the options, however inadequate the options were, it is a limitation of this study that options did not include social care practitioners. Social care practitioners will, however, have a critical rôle in dementia post-diagnostic care and support. Conclusions: The findings taken together provide important considerations for future policy-makers regarding post-diagnostic support for dementia in the English jurisdiction, urging the need for a rôle for clinical nursing specialists in delivering prompt post-diagnostic support and in avoiding, on the basis of clinical need, inappropriate care in hospitals. Dhedhi SA, Swinglehurst D, Russell J. (2014) ‘Timely’ diagnosis of dementia: what does it mean? A narrative analysis of GPs’ accounts, BMJ Open, Mar 4, 4(3):e004439. Leary A, Baxter J. (2014) Impact of lung cancer clinical nurse specialists on emergency admissions, Br J Nurs, Sep 25, 23(17), pp. 935-8. Manthorpe J, Clough R, Cornes M, Bright L, Moriarty J, Iliffe S; OPRSI (Older People Researching Social Issues). (2007) Four years on: the impact of the National Service Framework for Older People on the experiences, expectations and views of older people, Age Ageing, Sep, 36(5), pp. 501-7. There was a time when the GP used to be at the heart of a person’s community, as well as ‘delivering care’. For some people, there is no such thing as society, and the community consists of high street brands, banks and services (such as police or fire). I’ve spent some time thinking about the implementation of the ‘dementia friendly community’ policy in a number of jurisdictions. It really has struck me how, for whatever political reasons, nurses are not perceived to be the heart of dementia friendly communities in England. This, I feel, is a great tragedy. I don’t deny there are about a hundred different causes of a dementia, people’s social circumstances will differ (it is not uncommon for a female widower to develop a dementia while very lonely), cultural differences exist (for example in the rôle of the family in those of an Asian background), there are different rates of progression, and so on. On receiving a diagnosis, I think support services in dementia should be much stronger than now. What is all too commonplace is a travesty. People don’t know where to turn to for basic information about clinical aspects, or wider aspects about living in the community. As the dementia progresses, in the later stages, a focus will be to keep the person out of hospital wherever possible. Clearly, support and care in the community need to be funded properly. A ‘crisis’ for a person living with dementia is where a ‘stressor’ causes that person no longer to be able to cope with living in his or her usual environment. There could be a number of causes of that, but it’s noteworthy that many of them are in fact medical. I disagree a specialist nurse in dementia is necessarily a job for a community psychiatry nurse (“CPN”), as the workload of such nurses tends to be very big. But seeing a rôle for a CPN is not a trivial one, as I’m a fully signed up devotee of ‘parity of esteem’ where mental health is not seen as the ugly sister of physical health. For that matter, social work practitioners, who often find themselves at the heart of mental capacity decisions and safeguarding issues, should be on an equal footing too with other professionals. I said to Chris, a friend of mine living well with dementia recently, “GPs will even be in a good position to coordinate information”. I was in fact repeating words from a GP. In certain respects, in designing a system you wouldn’t wish to start from here. Without the focus on ‘budgets’ which do not necessarily deliver the ‘right kind’ of choice for the person with the health and care matters, it’s important that people with dementia have rights to a personal care plan, which is responsive to that person’s needs in real time. Knowing someone’s background is particularly essential in people with Alzheimer’s disease where longer term memories may be more intact. Knowing someone as a person is of course at the heart of personhood, through maybe a ‘life story’. I don’t think it should be a ‘luxury’ of people with dementia following them after diagnosis through the system. I think, in fact, it should be an essential aspiration. It’s really important that somebody can cross off inappropriate medications, such as perhaps antipsychotics, on a drug chart if the person with dementia might not benefit. It might help if a dementia specialist companion could spot problems in overmedicated people for blood pressure, for example. These individuals might become at risk of falls (and subsequent bone fractures if living with osteoporosis). Or somebody may be developing constipation or a stinging urine, becoming acutely confused. Dementia is not simply caused by conditions of old age, but frail individuals can do particularly bad when coming into contact with hospitals. In the scenario that a person with dementia at any stage does need to go into hospital, it would help enormously if there could be continuity of care between the community and hospital. People with all types of dementia can find unfamiliarity, in people and environments, extremely mentally distressing, and this can be detrimental to their physical health (taking a whole person care approach). There are few people better than paid carers, with pay above the national minimum wage, and not on zero hour contracts, and unpaid caregivers including friends and family, to inform on these care plans, but the person living with dementia is the one for whom the plan is being designed. All staff clearly need to be informed and skilled about dementia, and it is vital that resources are put aside for the adequate training of the workforce. The workforce themselves want this. It won’t be a surprise to you to learn that I see specialist nurses in prime position to offer a huge deal to the implementation of whole person care for dementia from the next Government? I think my views are broadly consistent with a number of places. A number of reports across jurisdictions have been important in establishing the direction of travel for acute hospital care: e.g. “Dementia care in the acute hospital setting: issues and strategies: a report for Alzheimer’s Australia” (Alzheimer’s Australia, June 2014), “Spotlight on dementia care: a Health Foundation Improvement Report” (Health Foundation, October 2011), and the Royal College of Nursing’s report “Commitment to the care of people with dementia in hospital settings” (RCN, January 2013). Examples of appropriate clinical leads, as the RCN themselves recognise, are “Admiral nurses” from the charity @DementiaUK, Alzheimer Scotland dementia specialist nurses, dementia champions in Scotland, and ward champions. Merely having ‘dementia advisors’ will be a case of the bland and ill informed leading the bland, on the other hand. Like many other ‘once in a lifetime opportunities’, if we get this right the service could be vastly improved. I am confident that, if given the proper funding to make this happen, and strong leadership cascades downwards, the next Government will rise to this challenge.